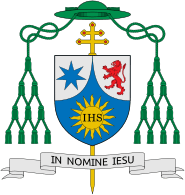 The Archdiocese of Manfredonia-Vieste-San Giovanni Rotondo (Latin: Archidioecesis Sipontinus-Vestanus-Sancti Ioannis Rotundi) is a Roman Catholic diocese in Apulia, south-eastern Italy. The historic Archdiocese of Manfredonia (or Siponto) was elevated from the status of diocese in 1074. At that time it was known after its see, Siponto, and Sipontinus persisted as its Latin name. It was combined in 1818 with the Diocese of Vieste. The addition of San Giovanni Rotondo to the name dates from 2002. The archbishops are seated in Manfredonia Cathedral. On July 15, 2009, Pope Benedict XVI named Bishop Michele Castoro of the Diocese of Oria as Archbishop. According to legend, the Gospel was preached at Sipontum (ancient name of Manfredonia) by St. Peter and St. Mark; more trust, however, may be placed in the tradition of the martyrdom of the priest St. Justin and his companions under Gallienus and Maximian about 255. The first bishop, whose date may be fixed, Felix, was at Rome in 465. In the time of Bishop Lawrence, during the pontificate of Gelasius I (492-496), allegedly took place on Mt. 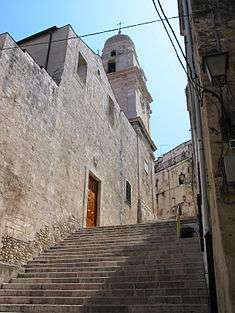 Gargano the apparition of St. Michael, in memory of which the famous Monastery of the Archangel was founded. About 688 Pope Vitalian was obliged to entrust to the bishops of Benevento the pastoral care of Sipontum, which was almost abandoned. The see was re-established in 1034, and under Bishop Saint Gerard (1066) it became an archdiocese. The ancient cathedral remained still at Sipontum, but with the building of Manfredonia, the archiepiscopal see was transferred to the latter city. Among the other bishops were Matteo Orsini (1327), later cardinal; Cardinal Bessarione (1447), administrator; Niccolò Perotti (1458), a Greek scholar and theologian; Giovanni del Monte (1512), subsequently pope under the name of Julius III; Domenico Ginnasio (1586), who suppressed the use of the Greek Rite at the high altar of the cathedral of Sipontum, a custom which had obtained until his day; Antonio Marcello (1643) who founded the seminary and restored the cathedral destroyed by the Ottoman Turks in 1620; Vincenzo Orsini (1675), afterwards pope under the name of Benedict XIII. This article incorporates text from a publication now in the public domain: Herbermann, Charles, ed. (1913). "Archdiocese of Manfredonia". Catholic Encyclopedia. New York: Robert Appleton.